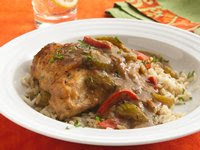 From Betty's Soul Food Collection... Ding, ding, ding--the health-o-meter declares our improved and lighter Smothered Chicken and Gravy recipe a winner, with its flavor boost coming from spices instead of fat. Cook rice in 2 2/3 cups water as directed on package, omitting butter and salt; keep warm. In 1-gallon resealable food-storage plastic bag, mix flour, seasoned salt, thyme, paprika and pepper. Fill medium bowl with water. Dip chicken pieces in water; shake to remove excess water. Place half of chicken pieces at a time in bag with flour mixture; shake to coat all sides. Remove chicken; reserve remaining flour mixture in bag. In deep 12-inch nonstick skillet, heat oil over medium heat. Add chicken; cook 8 to 10 minutes, turning occasionally, until browned on all sides. Remove chicken from skillet; set aside. In same skillet, stir reserved flour mixture into drippings; cook about 2 minutes, stirring constantly, until mixture is light brown. Stir in celery, bell pepper and onion. Cook 4 to 6 minutes, stirring frequently, until vegetables are crisp-tender. Stir in 2 cups hot water until well blended. Return chicken to skillet. Heat to boiling. Reduce heat to low; cover and simmer 40 to 50 minutes or until juice of chicken is clear when thickest piece is cut to bone (170 degrees F for breasts; 180 degrees F for thighs and drumsticks). Serve over rice; sprinkle with parsley. Calories 440 (Calories from Fat 130); Total Fat 15g (Saturated Fat 3g, Trans Fat 0g); Cholesterol 95mg; Sodium 530mg; Total Carbohydrate 41g (Dietary Fiber 5g, Sugars 2g); Protein 36g. Daily Values: Vitamin A 15%; Vitamin C 20%; Calcium 6%; Iron 15%. Exchanges: 2 Starch; 1/2 Other Carbohydrate; 0 Vegetable; 4 Lean Meat; 1/2 Fat. Carbohydrate Choices: 3. This entry was posted on 5:12 PM and is filed under Chicken . You can follow any responses to this entry through the RSS 2.0 feed. You can leave a response, or trackback from your own site.